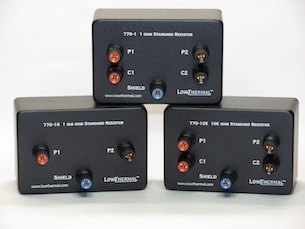 The Low Thermal Electronics 770 series of rugged, high accuracy working resistance standards are equally at home in the calibration laboratory, production manufacturing environment or for use in the field as portable transfer standards. Designed with reliability in mind, these standards provide a high level of mechanical performance intended to minimize damage and shifts caused by normal handling and the inadvertent "knocks" or "bumps" seen in working environments. Utilizing proven hermetically sealed metal foil and resistive film technology, the 770 series has excellent long term stability. The temperature coefficient of resistance is very low and temperature controlled oil or air baths are not necessary.